Children learn vital fire safety lessons with Sparky®'s Coloring Books -- NFPA's #1 product for kids. Right from the start you can help young kids learn about staying safe from fire. Young ones love coloring in the drawings, shapes, and characters as well as connecting the dots to complete the fire safety picture in this 16-page coloring book. As they do, they learn all about the sound a smoke alarm makes -- and what to do if they hear it beep. Kids can't wait to follow the Critter Club as they head to the Fire Station to meet Sparky the Fire Dog® and learn all about staying safe from fire. Their coloring adventure also takes them to Bunny's House to practice what they've learned -- including always looking for two ways out and getting outside quickly to their family meeting place. More than just another coloring book -- it's a teaching and learning tool, too! 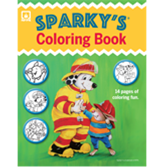 Sparky's Coloring Books are a terrific hands-on way to teach young children about fire safety through words and pictures. Kids can even color their own official Fire Safety Badge -- just like their friends in the Critter Club!